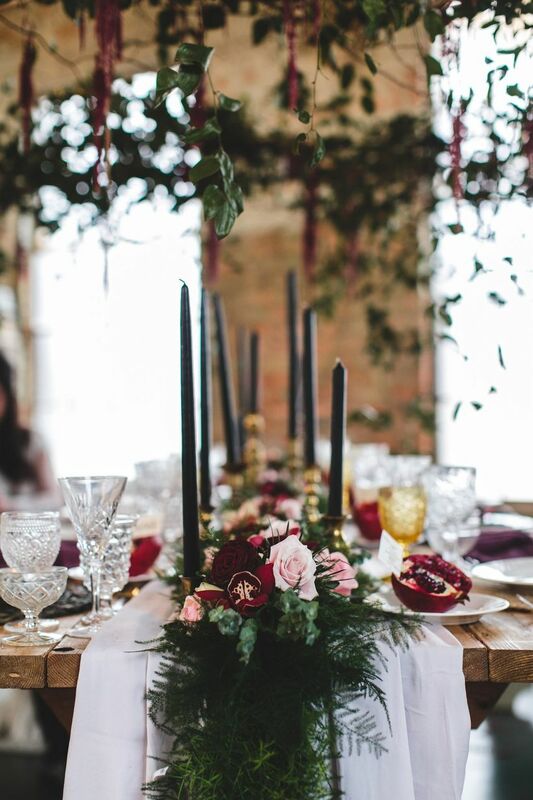 Whether you're goth at heart or want to run for the hills at the thought of a gothic wedding, we're here to show you how to put a trendy spin on this dramatic aesthetic. Gothic style is best known for being theatrical, dark, and even a little morbid at times (hello, Tim Burton movies). 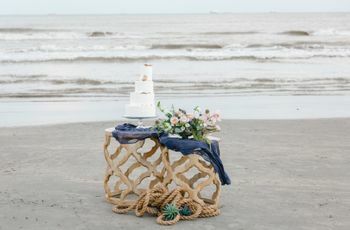 But gothic style can be surprisingly adaptable for your wedding day, and it's a great choice for couples who want something other than soft pastel colors. 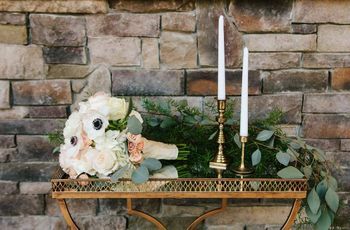 Thanks to Double Knot Photography and a talented team of wedding vendors from Abilene, Texas, this styled shoot shows exactly how take the basic elements of gothic style — moody colors, opulent details, and a sense of fantasy — and use them in new ways that are undeniably chic (with just a hint of goth). 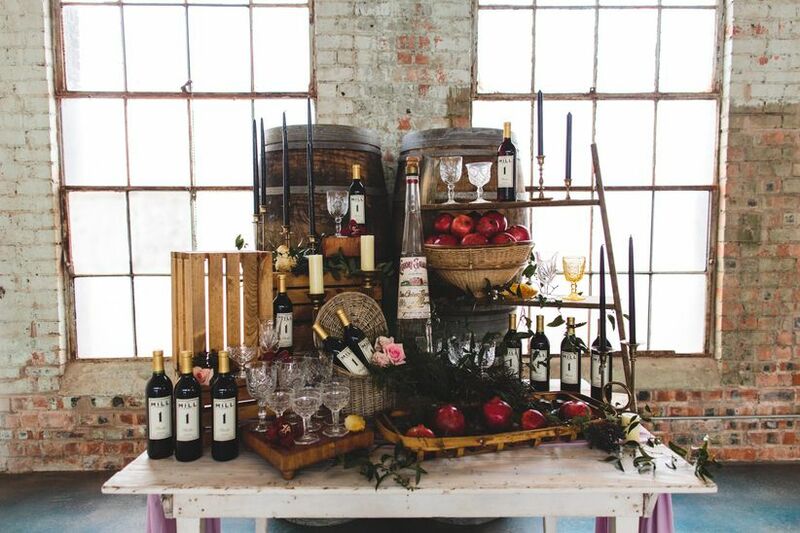 Check out these modern gothic wedding ideas to see exactly what we mean! 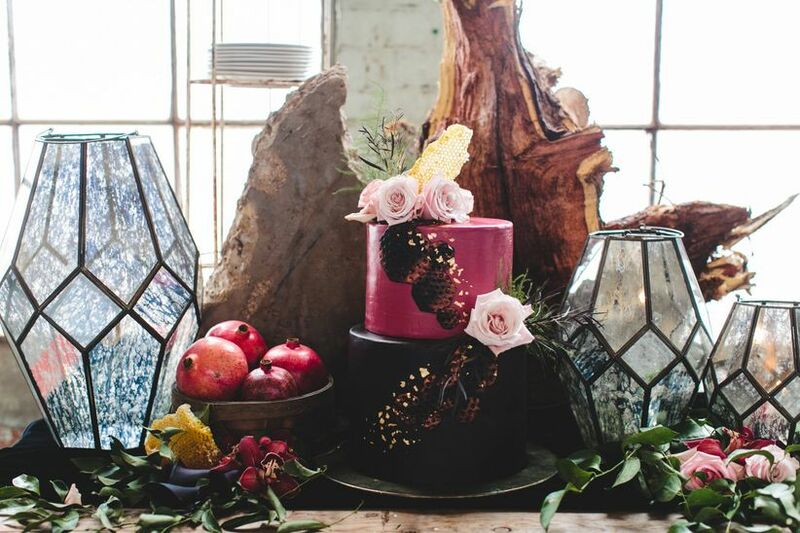 If you think gothic wedding details have to follow a dark color palette, think again! 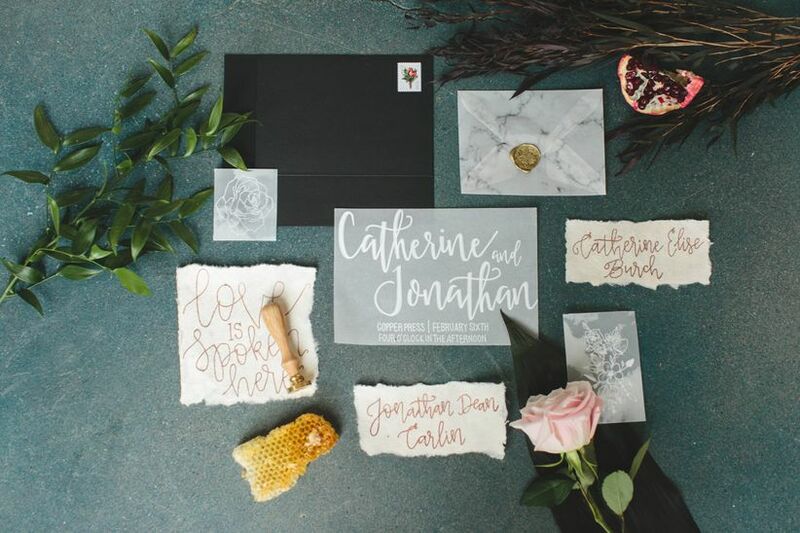 This gray vellum invitation suite features rose gold details, marbled patterns, and pretty floral motifs to create an Old World feel that taps into the Victorian undertones of gothic wedding style. A black envelope keeps the stationery from becoming too ethereal. 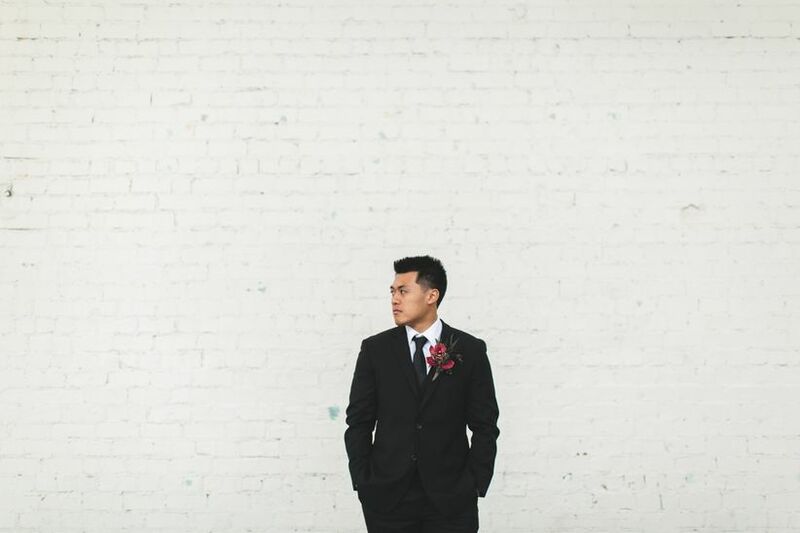 For grooms, a classic black suit is always in style and keeps your gothic wedding attire from looking costume-y. Opt for a skinny tie to give this timeless look an updated twist. 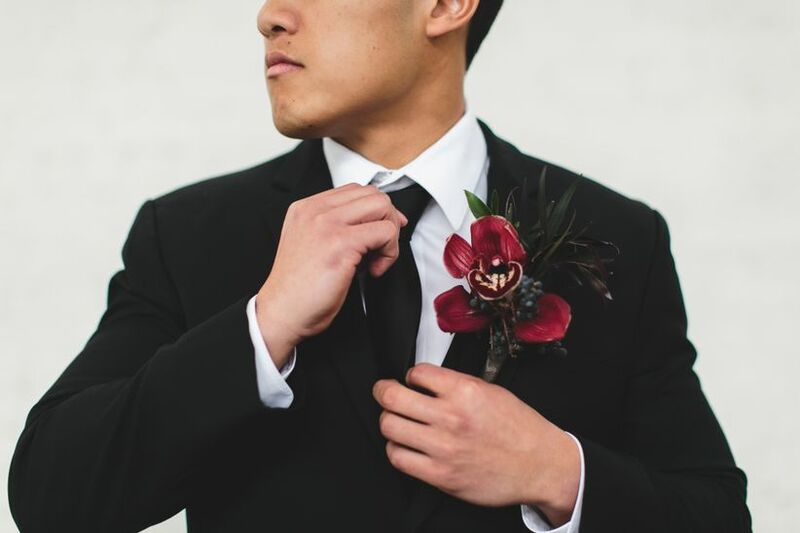 Accessorize your suit with a dose of color by adding a burgundy cymbidium orchid boutonniere. Dark blue viburnum berries and agonis provide even more color without straying from the gothic wedding theme. 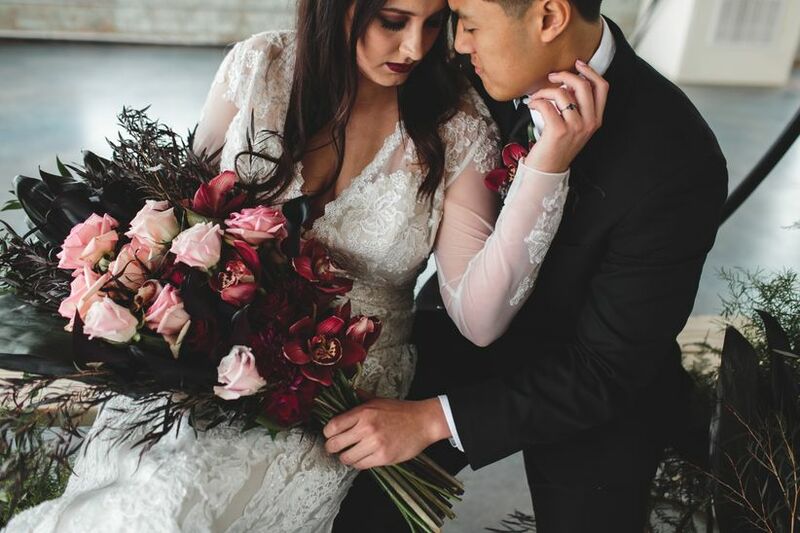 Add extra romance to your wedding bouquet by combining light pink roses with deep burgundy cymbidium orchids. 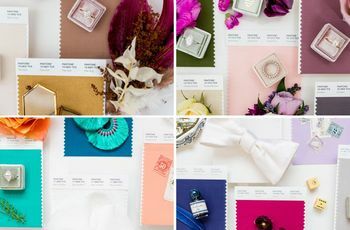 A presentation-style bouquet is a unique alternative for the bride who wants something gorgeous yet slightly offbeat. We're all about barely-there bridal makeup, but there's something about a dramatic look that's just as irresistible. 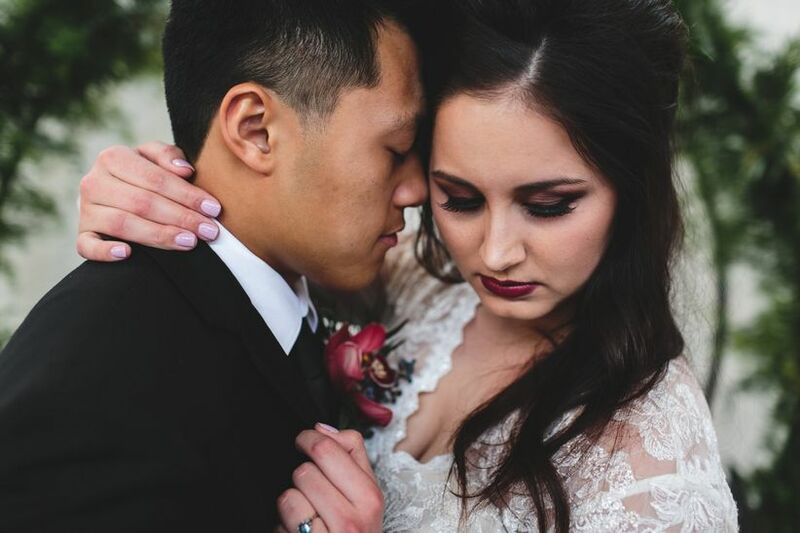 Smokey eyeshadow, full lashes, and berry lipstick are perfect for a gothic wedding. 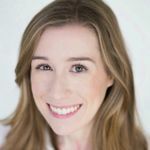 Keep the rest of your makeup classic and glowy so that the overall look feels bridal versus overdone. Purple calla lilies embellish a simple half-up hairstyle. 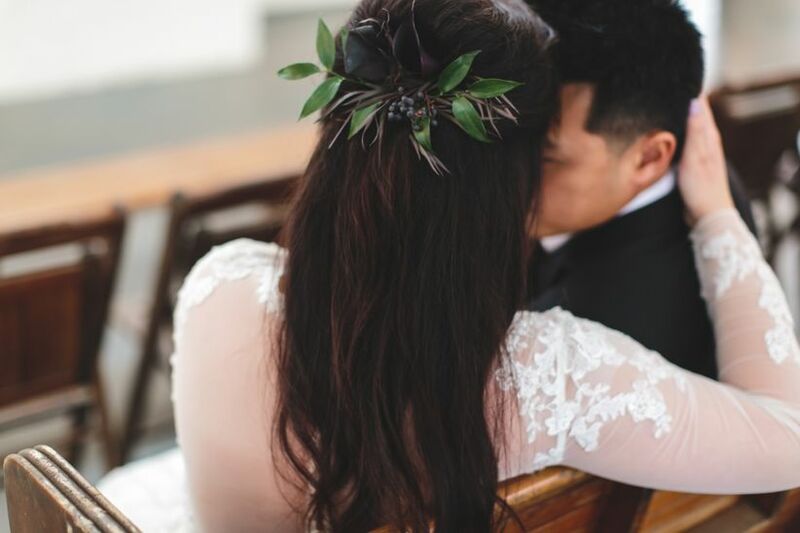 If you're wearing a long veil, you can easily clip it underneath the flowers. 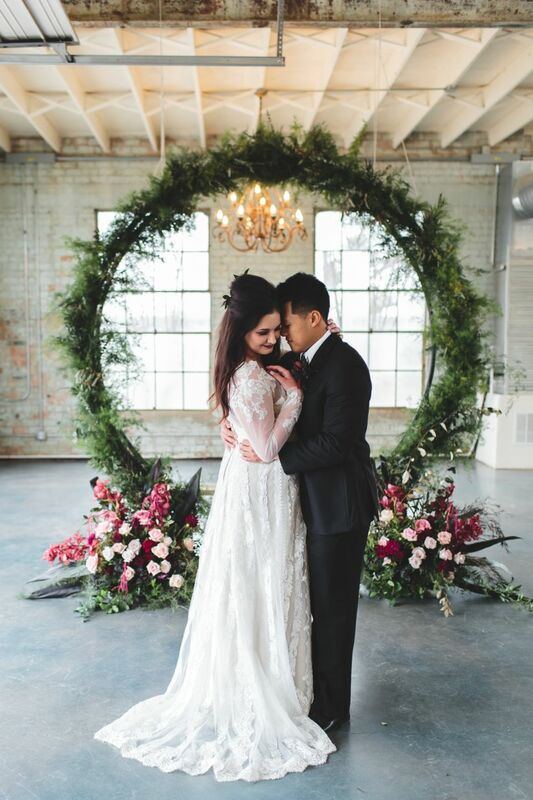 At first glance, a white wedding dress might seem too traditional for a gothic wedding, but it's all about how you style it. Long sleeves and lace are reminiscent of Victorian wedding dresses but feel contemporary when used with lightweight, flowing fabrics. Add some edge with colored velvet shoes or even a leather jacket! 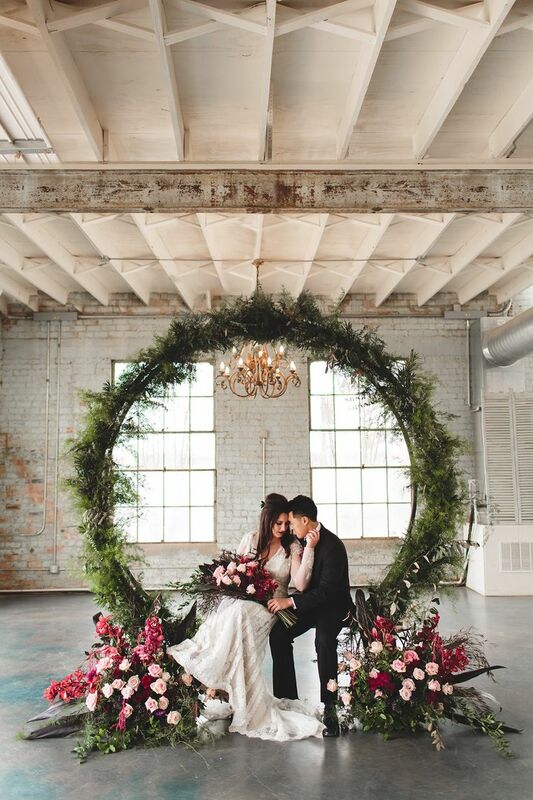 You've seen hanging floral centerpieces, but what about floral arches? 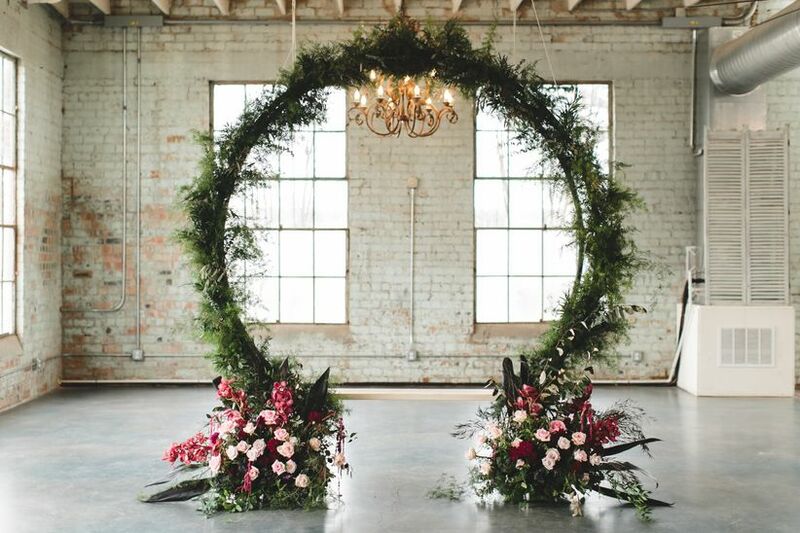 Surround your banquet tables with arches of trailing vines and amaranthus for a mysterious, magical effect as your guests are seated during the reception. 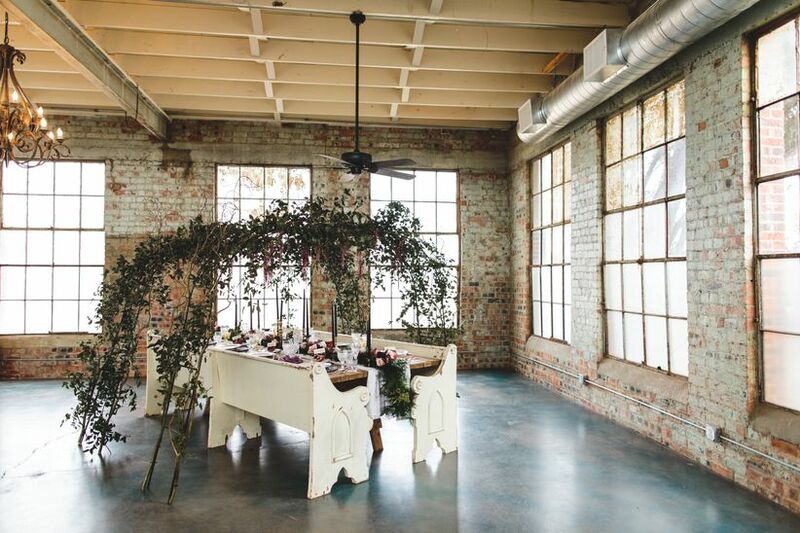 We especially love this idea for dressing up blank slate venues — think airy lofts, industrial warehouses, etc. Black taper candles are a must-have for any gothic wedding. 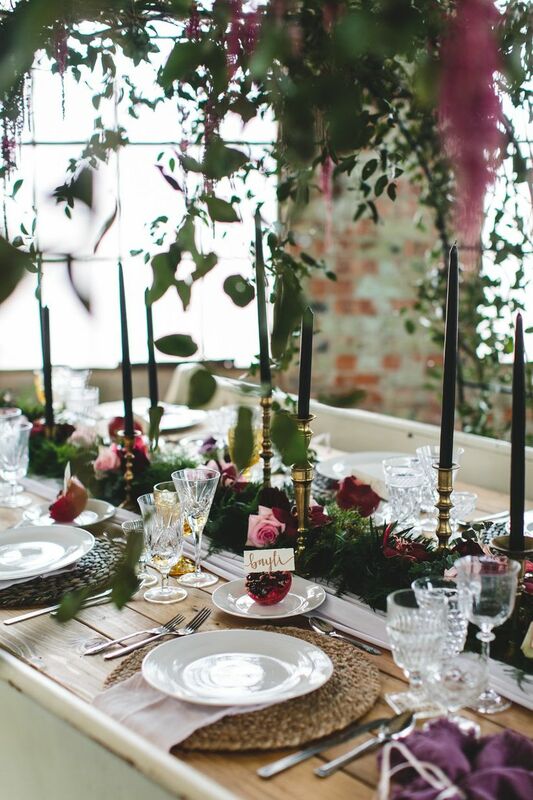 Even when the candles aren't lit, they bring a sense of moodiness to the tablescape. Pair them with vintage brass candlesticks for total opulence. 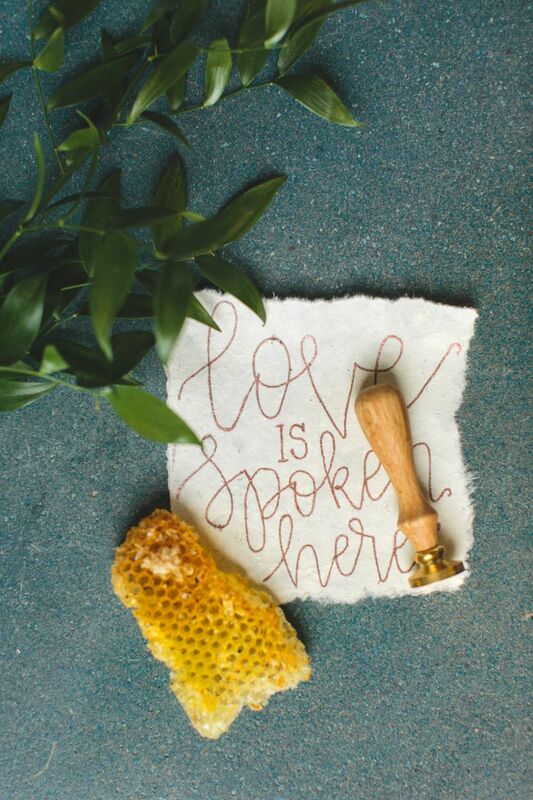 We're loving fresh fruit as wedding decor. For a gothic wedding in the fall, use fruits that are at their peak during autumn, such as pomegranates, figs, and pears. 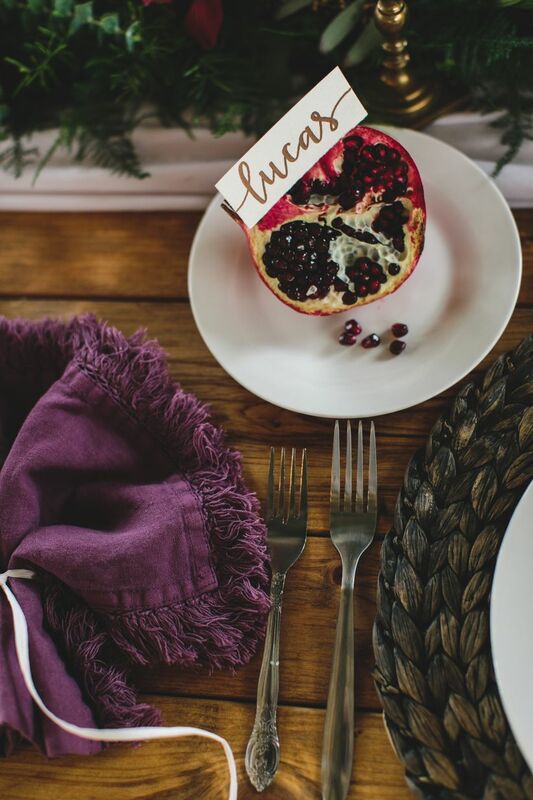 This pomegranate place card holder is functional and innovative! The dark red color is stunning, too. 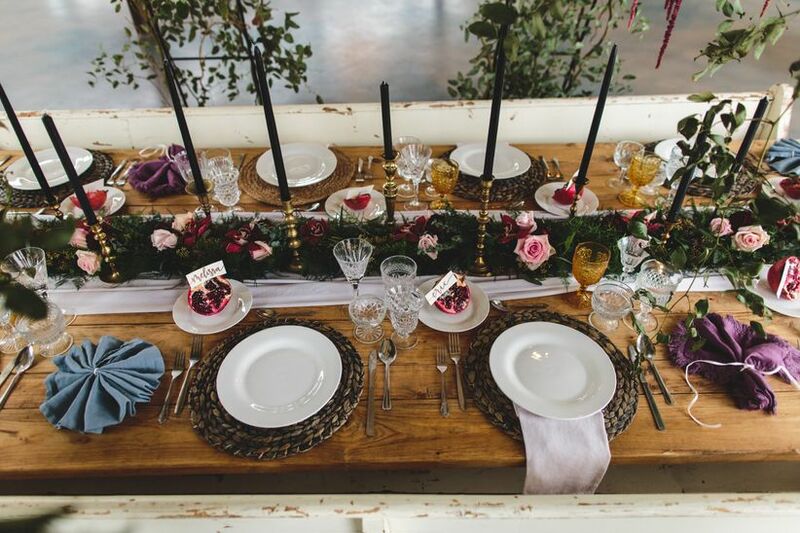 Enhance your wedding tablescape with a lush greenery runner and delicate roses. This combo looks incredible against a bare wood table while adding softness to bolder details like black tapers and dark woven placemats. 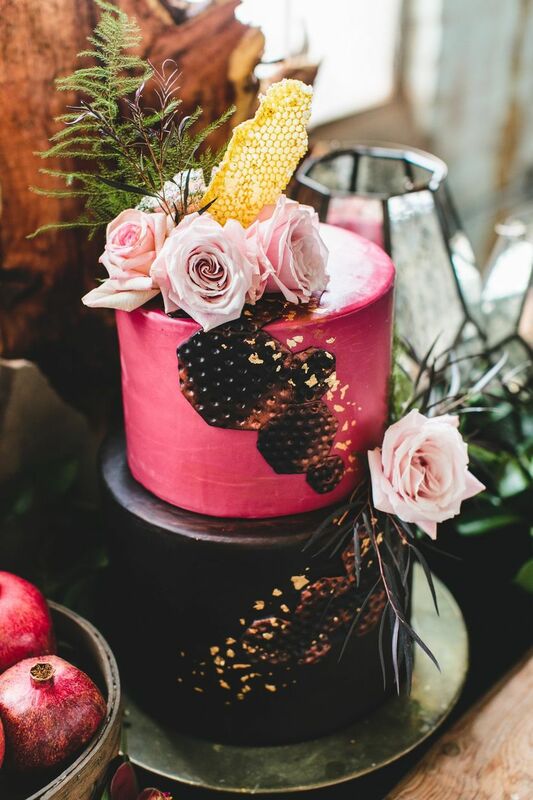 Edible gold foil is an oh-so-luxe addition to your wedding cake. Honeycomb details — including geometric cutouts and a wax honeycomb topper — are the epitome of decadence. Make this idea work for a gothic wedding by using black and raspberry red fondant. 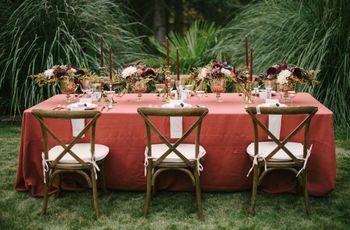 When it comes to indulging your guests, nothing is more enticing than an elaborate spread of wine, fresh fruit, and flowers. Use this as a self-serve beverage station or simply as a decorative accent that encourages your guest to make their way over to the bar.